We have all been there. Washing your face late at night can be a daunting task, especially if you had a long day and you are already falling asleep. But once you have the right products at your disposal, removing your makeup and prepping your skin before going to bed is a nice opportunity to pamper yourself and reflect on your day. I was recently in the market for a new face cleanser, one that would be gentle on my skin and formulated without harsh chemicals. I picked up this face wash mainly because it is affordable while being parabens, dyes and sulfates-free. I really enjoy how this silky white gel removes face oil and make-up very easily without drying or pulling the face. 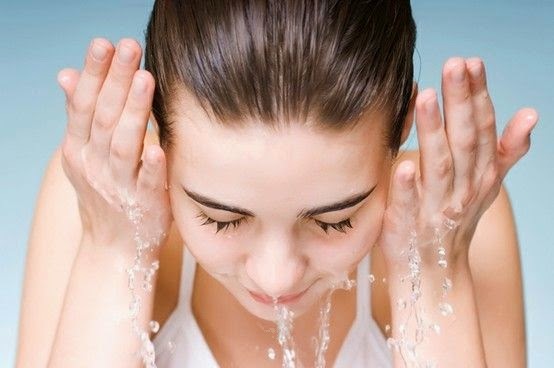 I tend to use two pumps of the product that I massage on my face in circular motions for a minute or two before rinsing it with lukewarm water. Since I wear contacts lenses, I make sure to use a face cleanser gentle enough on the eyes; this one fits the bill perfectly. This is one of Sephora's best-kept secrets! Formulated without parabens, sulfates and phtalates, this make-up remover work's wonder even with long-lasting eyeliner and mascara. The solution can be a bit oily but is gentle enough to be used by sensitive eyes and contact lenses wearers. This is such a straightforward product to use and the best part is that it won't break the bank. What's not to love? It's not the first time that I claim my love for this iconic French pharmacy staple. Indeed, I have been using this watery-like solution as a toner for quite some time already. I think this is the most effective product out there to get rid of leftover impurities and residues. You simply soak a cotton pad with the lotion and gently dab it onto your face and neck. It's just so easy to use and it leaves your skin so clean and refreshed, it's such a great feeling. And since it's very mild and soothing, it won't strip the moisture out of your skin nor will it leave it dry. Try buying the larger bottle, this way you'll get a much better deal. While I don't use face wipes as part of my everyday cleansing routine, I think that they do come handy on nights when you can't be bothered to wash your face because you are sick or simply tired. They are also great to put in your beauty bag - instead of bringing loads of bottles - whenever you travel. As you can notice, this torn pack of wipes has been traveling around a lot lately! I have tried many different brands over the years and I always seem to go back to these cloths. I find them extremely soft and gentle on the skin compared to others I have tried in the past. And they are pretty good at removing dark eye make-up, which is not always the case with face wipes in general. Are you using some of these products? If not, what are your favourite face cleansing products? 1 comment on "The Only 4 Face Cleansing Products You Need"
Facial cleansing is really very important as it helps in the removal of dirt, oil, and other unwanted debris. One should use good quality cleanser for this purpose.